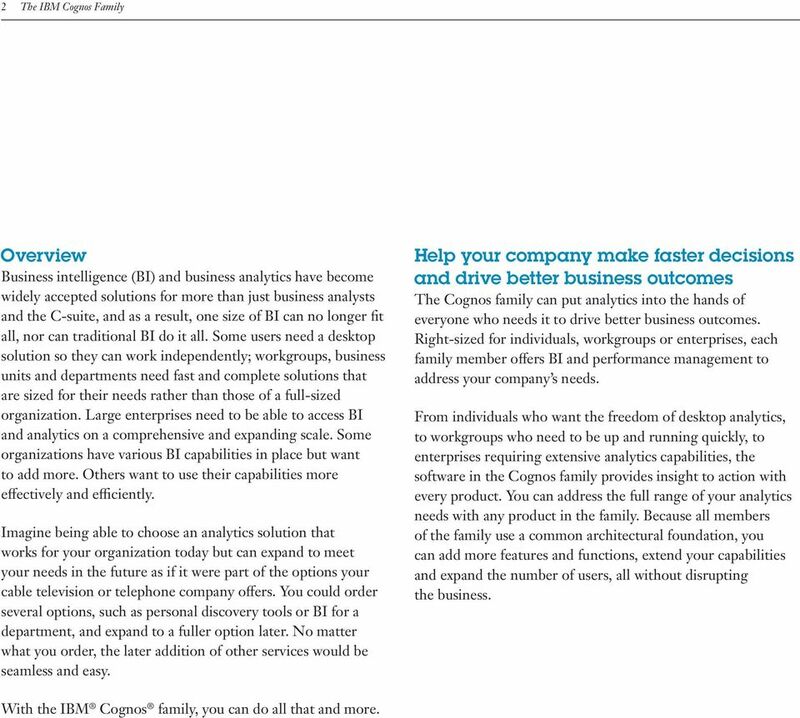 Download "The IBM Cognos family"
2 2 The IBM Cognos Family Overview Business intelligence (BI) and business analytics have become widely accepted solutions for more than just business analysts and the C-suite, and as a result, one size of BI can no longer fit all, nor can traditional BI do it all. Some users need a desktop solution so they can work independently; workgroups, business units and departments need fast and complete solutions that are sized for their needs rather than those of a full-sized organization. Large enterprises need to be able to access BI and analytics on a comprehensive and expanding scale. Some organizations have various BI capabilities in place but want to add more. Others want to use their capabilities more effectively and effciently. Imagine being able to choose an analytics solution that works for your organization today but can expand to meet your needs in the future as if it were part of the options your cable television or telephone company offers. You could order several options, such as personal discovery tools or BI for a department, and expand to a fuller option later. No matter what you order, the later addition of other services would be seamless and easy. Help your company make faster decisions and drive better business outcomes The Cognos family can put analytics into the hands of everyone who needs it to drive better business outcomes. Right-sized for individuals, workgroups or enterprises, each family member offers BI and performance management to address your company s needs. From individuals who want the freedom of desktop analytics, to workgroups who need to be up and running quickly, to enterprises requiring extensive analytics capabilities, the software in the Cognos family provides insight to action with every product. You can address the full range of your analytics needs with any product in the family. Because all members of the family use a common architectural foundation, you can add more features and functions, extend your capabilities and expand the number of users, all without disrupting the business. With the IBM Cognos family, you can do all that and more. 4 4 The IBM Cognos Family Cognos Insight: The freedom and flexibility of desktop analytics IBM Cognos Insight provides simple yet versatile analytic capabilities that empower all users to independently explore data (Figure 2), build scenario models and share insights. Unlike spreadsheets or dashboard products, Cognos Insight is based on proven enterprise technology that can grow with you when you are ready so you can extend into predictive analytics, managed reporting and performance management. Users can start quickly by using trusted BI data and reports that your IT organization has already built. Cognos Insight can also be employed as the contribution client to a Cognos TM1 planning application. Users can connect to the planning workflow, conduct detailed what-if scenario modeling with both corporate and personal data, and write back directly to the centrally managed plan. The Cognos Express analysis and planner modules also incorporate Cognos Insight capabilities, so, if you decide to grow your BI and performance management capabilities with Cognos Express, it fits right in. Cognos Insight enables organizations to bridge the gap between business user freedom and IT governance processes while creating a path to enterprise-level collaboration and management. Your IT organization can apply security and corporate standards to Cognos Insight files shared with the organization and publish these files to the enterprise, where they can be further enhanced or managed at the corporate level. Figure 2: Navigate and explore large data sets with Cognos Insight. 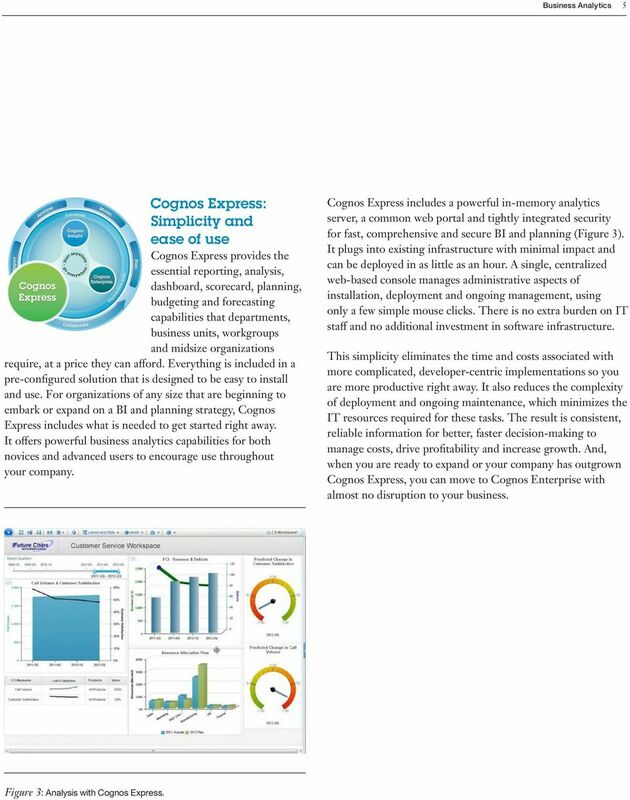 5 Business Analytics 5 Cognos Express: Simplicity and ease of use Cognos Express provides the essential reporting, analysis, dashboard, scorecard, planning, budgeting and forecasting capabilities that departments, business units, workgroups and midsize organizations require, at a price they can afford. Everything is included in a pre-configured solution that is designed to be easy to install and use. For organizations of any size that are beginning to embark or expand on a BI and planning strategy, Cognos Express includes what is needed to get started right away. It offers powerful business analytics capabilities for both novices and advanced users to encourage use throughout your company. Cognos Express includes a powerful in-memory analytics server, a common web portal and tightly integrated security for fast, comprehensive and secure BI and planning (Figure 3). It plugs into existing infrastructure with minimal impact and can be deployed in as little as an hour. A single, centralized web-based console manages administrative aspects of installation, deployment and ongoing management, using only a few simple mouse clicks. There is no extra burden on IT staff and no additional investment in software infrastructure. This simplicity eliminates the time and costs associated with more complicated, developer-centric implementations so you are more productive right away. It also reduces the complexity of deployment and ongoing maintenance, which minimizes the IT resources required for these tasks. The result is consistent, reliable information for better, faster decision-making to manage costs, drive profitability and increase growth. And, when you are ready to expand or your company has outgrown Cognos Express, you can move to Cognos Enterprise with almost no disruption to your business. Figure 3: Analysis with Cognos Express. 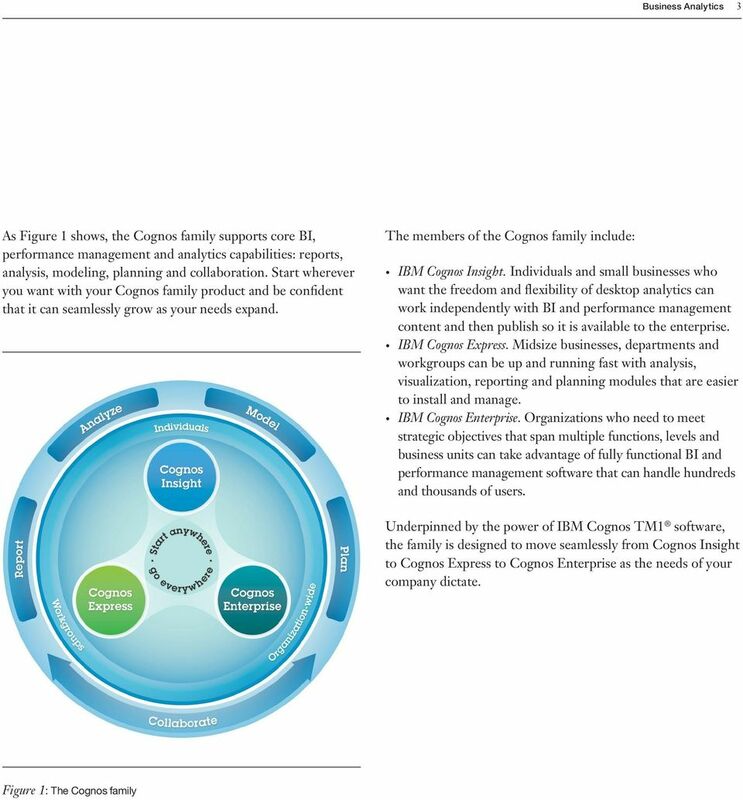 6 6 The IBM Cognos Family Cognos Enterprise: Meet strategic objectives Cognos Enterprise brings reporting, analysis, modeling, planning and collaboration together for smarter decisionmaking and better business outcomes. It equips users with what they need to freely explore information, analyze key facts, quickly collaborate to gain alignment with key stakeholders and act with confidence to drive better business outcomes (Figure 4). Cognos Enterprise is modular, integrated and open so that IT organizations are not hampered with excessive deployment and administrative tasks, yet it provides the full functionality that can support the analytics needs of hundreds and thousands of users throughout your entire organization. IT organizations can confidently deploy and proactively manage Cognos Enterprise. A complete view of system activity enables administrators to take action before a problem affects business, which can help meet and exceed service level agreements. It is also designed to effectively manage through change to lessen the effect on both IT and the business. Broad hardware support helps your IT organization deploy Cognos Enterprise on your company s current servers, workstations and more. There are also different deployment options: you can install Cognos Enterprise in your data center or in a private cloud or opt for hosted services. Your IT organization can also effectively use and enhance existing security standards and restrict access to data according to business requirements. To optimize the performance and on-demand response time of multidimensional data, Cognos Enterprise uses the 64-bit in-memory analytics engine of Cognos TM1, which is designed to analyze complex or large data sets for on-demand planning, analysis, profitability analysis and management reporting. In addition, aggregate operations can speed up computing time, and optimized caching and flexible refresh management enable the reuse of views that users repeatedly access. Cognos Enterprise is also designed to scale to support enterprise-level planning and analytics. 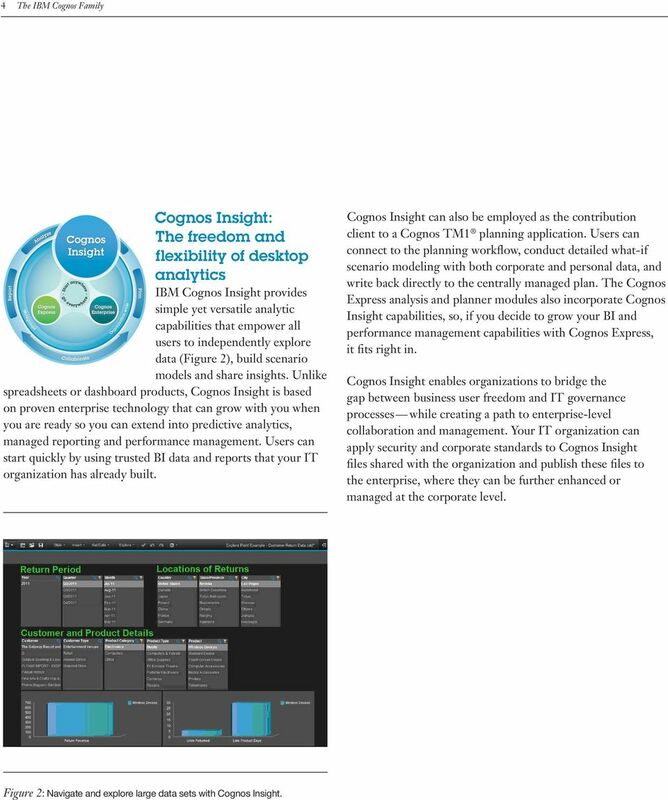 Figure 4: With Cognos Enterprise, users interact, share information and conduct comprehensive analytics in a unified workspace. 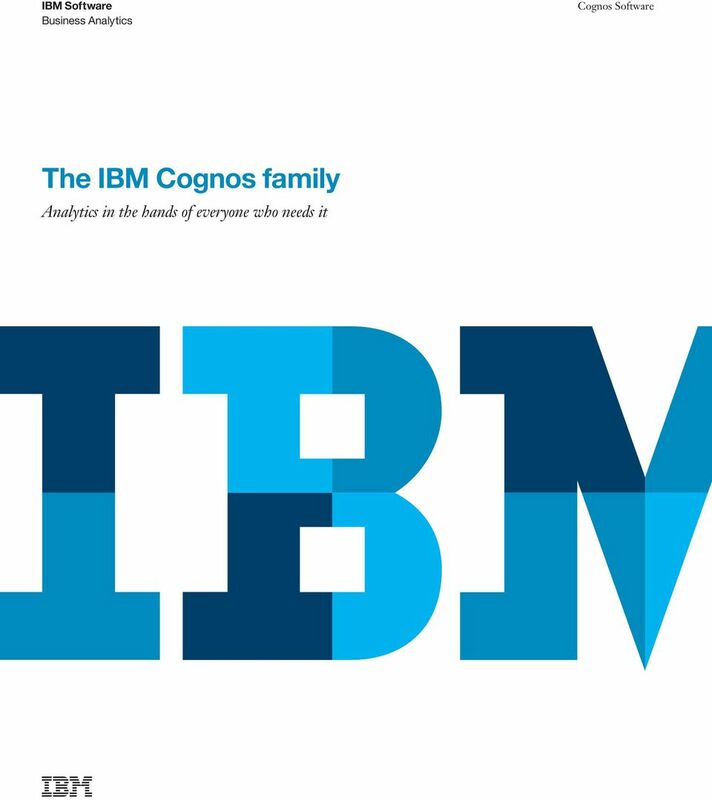 7 Business Analytics 7 Conclusion The Cognos family is right-sized for your organization and each product is designed to integrate with all the others in the family. Whether you want to deploy on a desktop, a single server, a server farm or all three, IBM has the solution for you. Better yet, address your most pressing needs now and grow your solution over time. For example: Start small, using Cognos Insight for data discovery and planning. Add a server to share that insight and create additional reports from larger data sets with Cognos Express. Or combine that insight with real-time and corporate information, add insights to scorecards and interact on mobile devices with Cognos Enterprise. 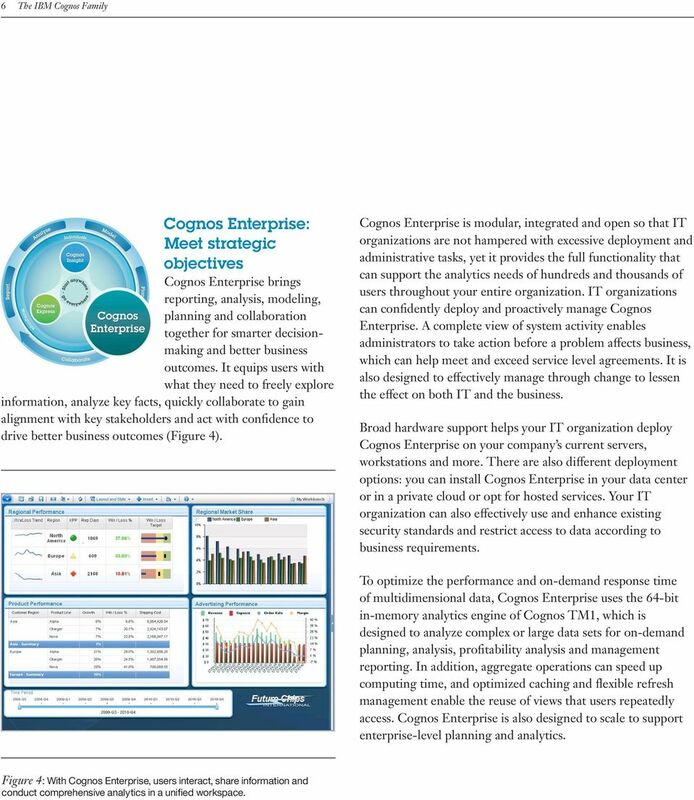 Extend organization report deployments with Cognos Enterprise. Provision the data discovery and planning capabilities of Cognos Insight to individual desktops. Provide individuals with access to corporate information and enable them to share and distribute their data and visualization with larger user communities. No matter which Cognos family member you choose, you can rest assured that you can provide the business with the same great self-service experience and consistency while making the most of your existing information infrastructure. 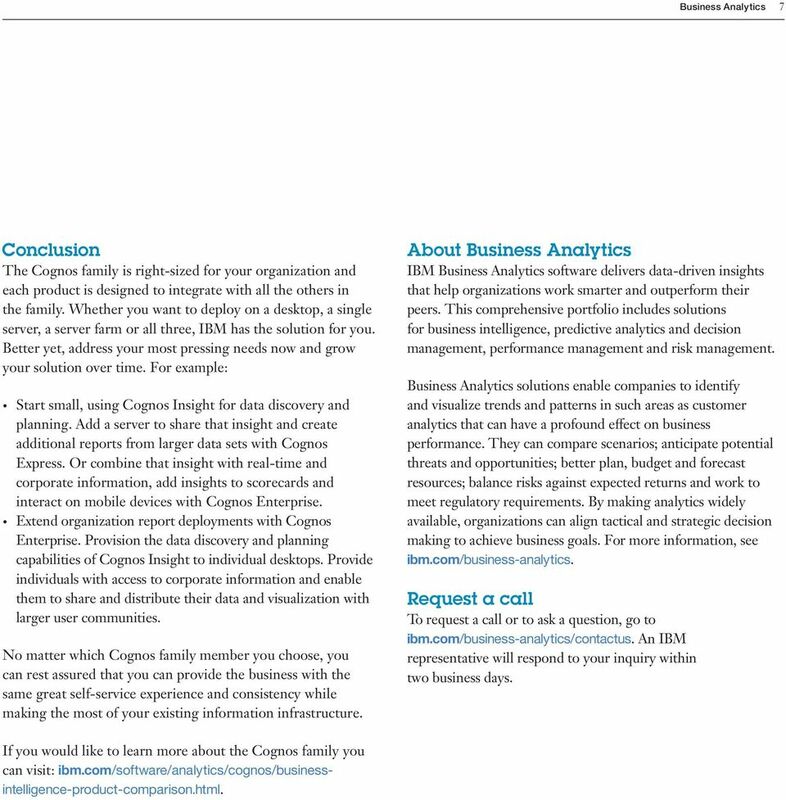 About Business Analytics IBM Business Analytics software delivers data-driven insights that help organizations work smarter and outperform their peers. This comprehensive portfolio includes solutions for business intelligence, predictive analytics and decision management, performance management and risk management. Business Analytics solutions enable companies to identify and visualize trends and patterns in such areas as customer analytics that can have a profound effect on business performance. They can compare scenarios; anticipate potential threats and opportunities; better plan, budget and forecast resources; balance risks against expected returns and work to meet regulatory requirements. By making analytics widely available, organizations can align tactical and strategic decision making to achieve business goals. For more information, see ibm.com/business-analy tics. Request a call To request a call or to ask a question, go to ibm.com/business-analy tics/contactus. An IBM representative will respond to your inquiry within two business days. If you would like to learn more about the Cognos family you can visit: ibm.com/sof tware/analy tics/cognos/businessintelligence-product-comparison.html.